Take a new spin on an original classic. From the same pedigree as the first Vespa prototype built by Piaggio in 1946, the LX is 60 years in the making. Witness the evolution of style, comfort, and performance with the core values of Vespa that never change: eco-friendly engineering, passion, individualism, and integrity. With the Vespa LX, you'll quickly see commuting in a whole new light. Commuting and errands can be everything from mundane to frustrating. Be amazed by how those bothersome, everyday scenarios become a lot more fun when you surround yourself with the style, performance and safety that is the Vespa LX. Congestion is for everyone else. Zip through traffic with a low center of gravity and a larger front wheel (11 inch front - 10 inch back), which provides more control and agility. And your posture has never looked better. The ergonomically-designed seat allows for your legs and arms to be held at correct angles and your torso straight, for a comfortable ride. 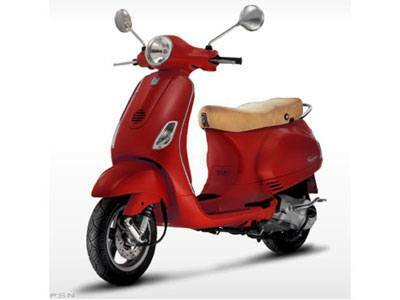 The Vespa LX is offered in a 50 cc and a roaring 150cc version. So take life at the speed you want. The LX 150 lets you do an impressive highway like 59 miles per hour to get you where you want to go, fast. Brake at a red light with confidence, with the LX's advanced mixed-type braking system. The front has a 7.8 inch diameter disc, with hydraulic linkage and a dual opposed piston hydraulic caliper. The back has a 4.3 inch diameter drum with mechanical linkage. What a view! See exactly where you're going with a wide arc front headlight. A halogen headlamp provides strong illumination even at night. Shine during the day too, as the LX returns to the classic rounded Vespa rear light. Control the lights and view other traditional functions on the elegantly-designed dashboard. During the day let people soak in the personality of your new Vespa. Clean lines, elegant colors, sophisticated chrome linings and a modern sense of style-it's all in the details. A load bearing, single-steel chassis combined with a high-performance engine keeps Vespa in a class of its own. A single chassis ensures nimble handling and guarantees that the only thing longer about your ride is the extended LX lifespan. TubelessFront: 110/70 - 11 in. Rear: 120/70 - 10 in.